Sun, H., Luo, Y. and Miao, Y. (2018). Purification of Globular Actin from Rabbit Muscle and Pyrene Fluorescent Assays to Investigate Actin Dynamics in vitro. Bio-protocol 8(23): e3102. 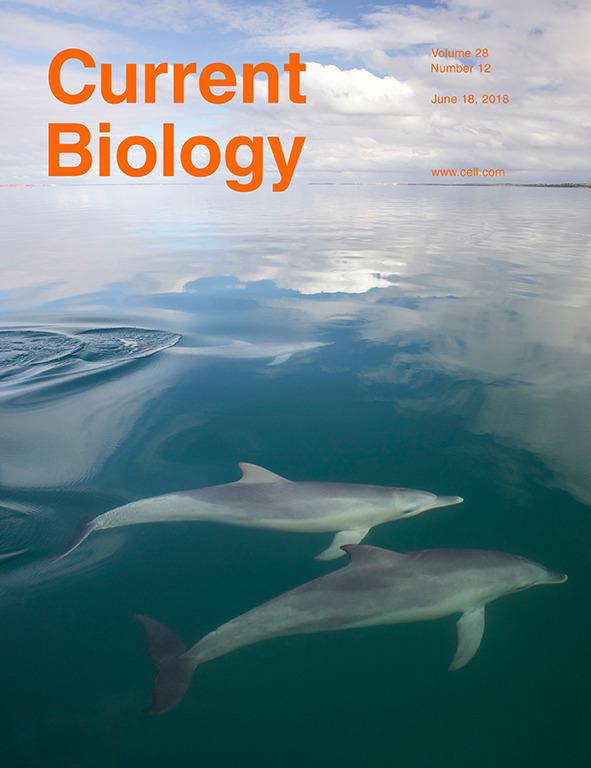 DOI: 10.21769/BioProtoc.3102. Pyrene Fluorescent Assay is established to monitor the dynamic actin nucleation, elongation, capping and disassembly in vitro. This technique provides an easy handle procedure and straightforward visual data analysis. By coupling actin purification and polymerization assays in this protocol, the readers could quickly get the affordable and straightforward assays to study actin dynamics. Actin dynamics play essential roles in crucial aspects of cellular biological functions, such as cell motility, endosomal trafficking, scaffolding and responses to external stimuli (Pollard and Cooper, 2009; Weinberg and Drubin, 2012; Sun et al., 2018). Rearrangements of actin cytoskeleton including nucleation, elongation, stabilization, capping, crosslinking and depolymerization are tightly controlled by actin-binding-proteins (ABPs) (Pollard, 2016). In vitro studies of the biochemical functions of those ABPs in actin regulation provides insights in understanding the mechanism of actin network regulation. Here, we provide an easy understanding protocol which can be applied for actin cytoskeleton-related biochemistry experiments, including actin purification, pyrene actin assay. The protocol provides approaches to monitor the actin assembly with other actin-binding-proteins in vitro and help researchers to learn about the actin dynamics process under different conditions. This protocol provides a clear table template for users to prepare a reaction mixture. Complicated calculation steps are simplified. This protocol uses high throughput multi-well methods instead of cuvette measurements to provide higher throughput and good parallel comparison among samples. Prepare 1 L 1x G-buffer (see Recipes). Rehydrate and grind the 2.5 g lyophilized rabbit skeletal muscle acetone power in 50 ml G-buffer. Clear the solution by centrifugation at 27,000 x g for 1 h at 4 °C in the JA25.50 rotor (Beckman Coulter). Collect the solubilized actin in the supernatant. Polymerize actin in a 250 ml beaker by adding 50 mM KCl and 2 mM MgCl2 for 1 h followed by addition of 0.8 M KCl for 30 min at 4 °C. Pellet filamentous actin (F-actin) by centrifugation at 150,000 x g for 3 h at 4 °C using Ti50.2 rotor (Beckman Coulter). Pour off the supernatant and gently wash the surface of the pellet twice with 1 ml G-buffer. Transfer the pellet to a 10 ml homogenizer using a spatula (Do not let the pellet dry) and add 1 ml G-buffer to the homogenizer. Homogenize the pellet by a homogenizer. Brief sonicate the pellet using the Ultrasonic Processors on ice using 1 s on, 1 s off cycles at 30% amplitude for 4 s.
Take out the homogenized solution and dialysis against G-buffer for 36 h at 4 °C using SnakeSkinTM dialysis tubing. Change the old G-buffer with a fresh one every 12 h (this step will allow the F-actin depolymerize). Change the old G-buffer with the fresh buffer every 12 h.
Clean the monomeric actin by spinning at 200,000 x g for 2.5 h at 4 °C using a Ti55 rotor and collect the supernatant. Equilibrate the Sephacryl S-300 HR column with 150 ml 1x G-buffer. Load the supernatant collected from Step A14 to the column using 5 ml sample loop. Perform size exclusion chromatography using 1x G-buffer. Collect the monomeric actin peak after gel filtration chromatography (elution volume is around 50-60 ml) (Figure 1). Determine the concentration of individual fractions from gel filtration and store the G-actin solution at 4 °C (The G-actin could be stored at 4 °C without significant activity lost). Figure 1. 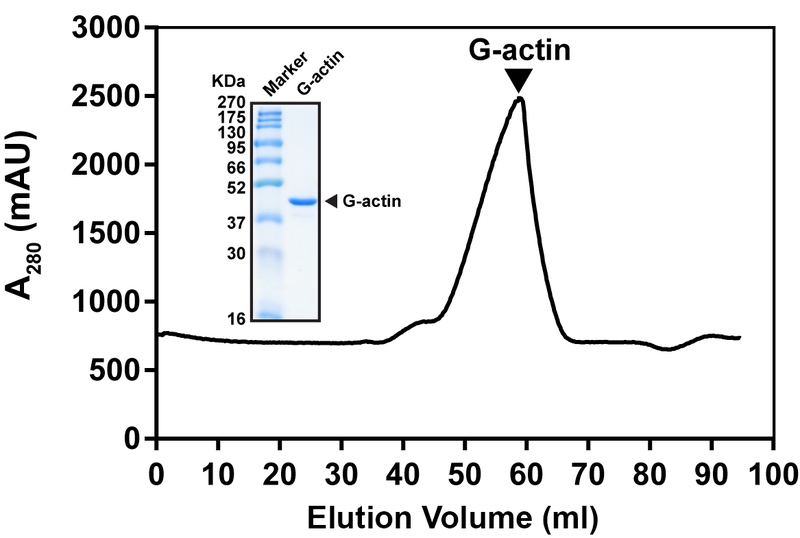 Typical gel filtration profile of G-actin purification. Actin was purified from Sephacryl S-300 HR column. G-actin was eluted at 50-60 ml. Inset showed SDS-PAGE analysis of G-actin eluted peak fraction. Turn on the Fluorescence spectrophotometer Cytation 5 and start the software. Prepare 1 ml 10x KME buffer and 10 ml 1x G-buffer (see Recipes). Calculate the polymerization reaction materials needed based on Table 1. For one reaction, actin mix volume is 25 μl; maximum additional protein volume is 10 μl, 10x KME buffer volume is 12 μl and tops up with 1x G-buffer to total volume is 120 μl. Prepare target protein stock according to Table 1. Prepare actin mix based on Table 2 and keep on ice for 5 min. Prepare reaction mix (without 10x KME) in Corning® Costar® 96-well cell culture plates according to Table 1. Add 12 μl 10x KME to each well together using a multichannel pipette and gently mix the reaction solution. Transfer 110 μl reaction solution into a 96-well black plate and initialize the Fluorescence spectrophotometer for data acquisition. Plot the data using Origin software (Figure 1 is a typical example for actin polymerization assay). *G-buffer is used to top up the reaction volume to 120 μl. **Maximum total volume of protein and protein buffer is 10 μl. *Use the value of the actual G-actin and pyrene-labeled actin stocks employed for the experiments. **Volume is based on real reaction volume. Figure 2. Pyrene actin polymerization assay example. Two micromolar actin mixed with 5% pyrene-labeled actin was polymerized with indicated concentrations of Arabidopsis formin AtFH1(FH1COOH). 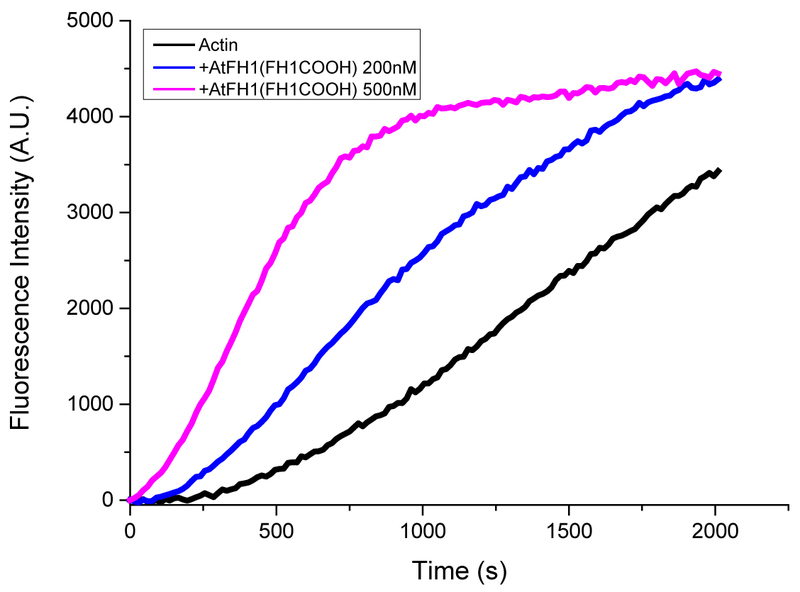 Black, actin only; Blue, 200 nM AtFH1(FH1COOH); Purple, 500 nM AtFH1(FH1COOH). These three curves are the controls for the typical behavior of actin and formin. All the in vitro pyrene actin assays were analyzed in Microsoft Excel or Origin software. Pyrene fluorescence intensity (Y-axis) is plotted as a function of time (X-axis). The final data could be plotted using the time window for the different purpose. To monitor the initial nucleation activity, usually < 1,000-1,500 s is sufficient to reflect the initial nucleation rate. The protein activities for different steps of actin polymerization may vary for some proteins depends on the protein stability during storage. Appropriate controls should be included in the same experiment (e.g., Actin only control should be included all the time to know whether actin is active). For non-stable proteins, the use of freshly prepared protein is recommended for biological replications. Pyrene actin assay results could be varied because of protein activity and practical reason. Replicate experiments are needed. Timing is important for the experiments. In order to get better reproducible results, time control of sample handling is necessary. For example, some actin-binding protein (such as formin) will rapidly accelerate actin polymerization in seconds. Try to avoid creating any bubbles during pipetting. Use cut tips to pipet filamentous actin. Prepare fresh G-buffer and F-buffer for each day experiments. This study was supported by was NTU startup grant (M4081533), NIMBELS (NIM/01/2016), MOE Tier 2 (MOE2016-T2-1-005S), and MOE Tier 1 (RG38/17-S) to Y. Miao in Singapore. The protocol was adapted from Sun et al. (2018). Pollard, T. D. (2016). Actin and actin-binding proteins. Cold Spring Harb Perspect Biol 8(8) pii: a018226. Pollard, T. D. and Cooper, J. A. (2009). Actin, a central player in cell shape and movement. Science 326(5957): 1208-1212. Sun, H., Qiao, Z., Chua, K. P., Tursic, A., Liu, X., Gao, Y. G., Mu, Y., Hou, X. and Miao, Y. (2018). Profilin negatively regulates formin-mediated actin assembly to modulate PAMP-triggered plant immunity. Curr Biol 28(12): 1882-1895 e1887. Weinberg, J. and Drubin, D. G. (2012). Clathrin-mediated endocytosis in budding yeast. Trends Cell Biol 22(1): 1-13. How to cite: Sun, H., Luo, Y. and Miao, Y. (2018). Purification of Globular Actin from Rabbit Muscle and Pyrene Fluorescent Assays to Investigate Actin Dynamics in vitro. Bio-protocol 8(23): e3102. DOI: 10.21769/BioProtoc.3102.